Puranik Rumah Bali: Welcome to the high-life that is nothing short of a 5-star hotel! Mumbai is a beautiful city in the state of Maharashtra that is known for its modern-day living, education hubs, entertainment zones, job opportunities, incredible nightlife and so much more. Mumbai is one city that can turn all your dreams into reality! The real estate sector in Mumbai has doubled over the years with a number of projects through different parts of the city. Thane is a part of the Mumbai Metropolitan Region (MMR). 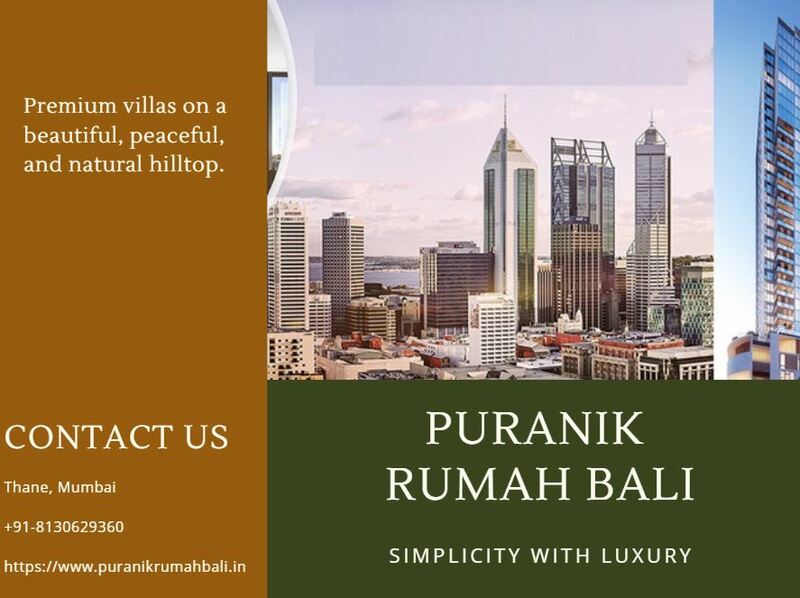 Puranik Rumah Bali is a new residential project by Puranik Builders Limited that offers a well-endowed lifestyle of pure gratification! Extend over 13 acres of luscious land, this development contains extravagant towers (G +30) that are designed to perfection and offer 1BHK, 1.5BHK and 2BHK apartments that are Vaastu-compliant and packed with luxury to bring you good luck and prosperity every day! The apartment carpet areas start at 429 sq. ft. and go up to a beautiful 685 sq. ft., providing ample space to meet all your needs and requirements. Puranik Rumah Bali Thane is a fabulous residential development that offers an A-class lifestyle which will make you feel like a king! The apartments are spacious and contain luxury fittings & fixtures, branded vitrified flooring in every room, decorative main doors, large balconies and windows providing peaceful landscape views of lush greens, elegant modular kitchens with high-quality counters and multiple provisions, top-notch electrical sockets and switches located perfectly for convenient access, hi-tech safety features and the list goes on. This development offers a plethora of world-class external amenities that will always keep you active, rejuvenated, happy and entertained each and every day. Welcome to a world where you can create beautiful memories with your family and friends that will be cherished for a lifetime! The external amenities include a clubhouse, meditation centre, swimming pool, deck, cabanas, aromatherapy flower beds, jogging track, well-equipped gym, multiple sports facilities and a play-zone for your kids, shopping centre, amphitheatre, multipurpose hall, barbeque area, party lawn, reflexology pathway, beautiful sit-outs to spend time with family and friends, nursery school, landscape garden, ATM provision, efficient car parking, swift elevators, power back-up for emergencies, intercom facility and well-trained security. Located at Ghodbunder Road, Thane, Mumbai, this development comes in close proximity to a number of your daily and emergency landmarks, providing you a world of convenience that will truly please you and every member of your family. Places like schools, colleges, banks, ATMs, automobile showrooms, supermarkets/hypermarkets, general stores, shopping centres, cinemas, cafes, restaurants, clubs, pubs, lounges, malls, entertainment zones, water parks, hospitals, medical & research centres, all kind of public transport, highways, and a lot more can be accessed without worrying about long-distance travelling. Starting at a price of Rs.55 lakhs and going up to Rs.87.70 lakhs, the Puranik Rumah Bali price is simply impressive and well-planned to meet your budget perfectly! If you are looking out for a residential space that is high on luxury and affordable at the same time, this development is the ideal destination to be at. You can choose from a number of payment plans along with home loan facilities through associated banks, NRI services, customer support and more for a purchase of pure content. Located at Ghodbunder Road, Thane. 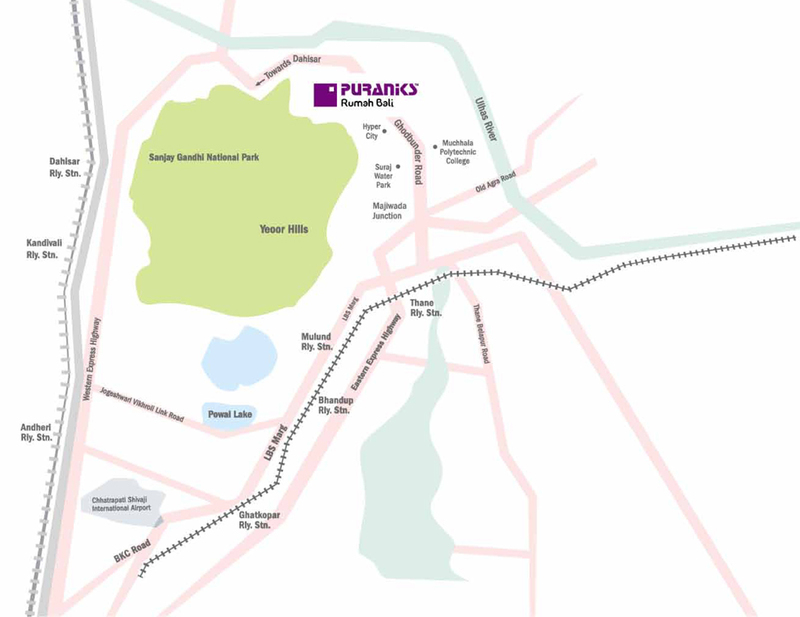 Close proximity to Eastern Express Highway. This is a great project with really good features and amenities.